So Copenhagen, probably the most advertised city in the world. There's no beauty pageants for cities, but if there was, Copenhagen would probably be the most beautiful in the world. My first impressions is that Denmark is a little bit like Scotland i.e. windy and cloudy, but with less rain and the grass is actually GREEN. It wasn't too difficult to get to my hotel as the airport has a metro station direct to central Copenhagen. The ticket machines are annoying as they don't accept notes and I didn't have the DK36 in coins. So I had to line up at the staffed counter. In a way this was lucky because it reminded me to get Copenhagen tourist map containing the self-guided walk of the city. Nothing really wrong with my hotel when I got there, just a bit basic. I've probably been spoilt from my 5 months of travelling in Asia and yes, Copenhagen is an expensive city. At £50 a night, I was still expecting a bit more than what looked like a bedsit. The building is obviously a converted block of flats with steep flights of stairs and no elevator. A painful climb up 4 floors everytime I forgot something. It's about 1045 now and I've decided to get some coffee, then go through with the self guilded walk. Not only are hotels expensive, but food is too. DK43 (about £5) for a cup of coffee and pastry. Erm, how about if I just take a sip, how much is that? For a city where coffee is so widely consumed, Copenhagen is probably the only city in the world without a Starbucks (I think). And another Carlsberg joke would probably get me thrown out of the country. Finally south down to City Hall and Tivoli amusement park. Even as a normal walking pace, the whole walk still took 7 hours. It's past 6PM and the Danes take their working hours literally with many shops and even restuarants closed. I'm quite tired anyway and I just head back to the hotel having stocked up on snacks from a 7-11. The days starts with a trip out to Roskilde. 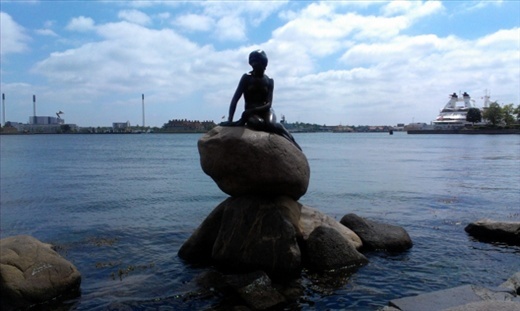 The ancient capital of Denmark and a World Heritage Site. The city is actually only 25 minutes by train from Copenhagen Central, then another 5 minutes walk from Roskilde train station. The 3 main things in Roskilde is the WHS of Roskilde Cathedral, the Viking Museum and the Old City. The Old city is certainly pictureques, the Viking museum is extraordinary with it's amazingly well preserved viking ships and informative viking history. Then there's the Cathedral. At first I wasn't that impressed from the outside with it's monilithic red. Inside it's really beautiful with it's mixture of delicate and beautifully crafted gold ornaments, Greco-Roman sepulchre, reinansance inspired chapels, and surprising attractive iron gratings throughout the church. After 4 hours in Roskilde, it's was time to head back as no visit to Copenhagen is complete without seeing Chritiania. So to round off the day, I do another talking tour all the way from Central Station. The area in Christiana used to be army barracks, but now a self-governing free town. It's quite an interesting little area when juxtaposed against the rest of the city mostly because it looks like a squatter's yard next to a rich man's mansion. Built around the idea of communual society and alternative lifestyles, free also seems to mean the freedom to openly sell and smoke Marijuana. After hanging out with the hippies for an hour, I decide to head back to the hotel and discovered a budgeting problem. I'd only changed about DK900 and have only about 70 left, half of which will be the train fare to Copenhagen airport and with dinner still to buy. So there's nothing for it but to do the 2km walk. Overall, Copenhagen is a great place for walking and sight-seeing. Although the walking for 7 hours is tough, the terrain is mainly flat. Walking is also the best way of experiencing the history, culture and daily life of the city. The Danes have done an excellent job of maintaining the architectural style of the city even through the new buildings. It's many modern buildings that don't create an eyesore designd in modernist architecture and finely preserved older buildings should be an great experience for architecture buffs or anyone who simply appreciates beautiful buildings. The only downer is that as a vegetarian, there's no chance to sample any of the national dishes. The Danes do love freshly baked good with many bakeries across the city. Try the bakeries and you'll find out why Danish Pastry existis in the English vernacular. They're deeeeeeeeeelicious.